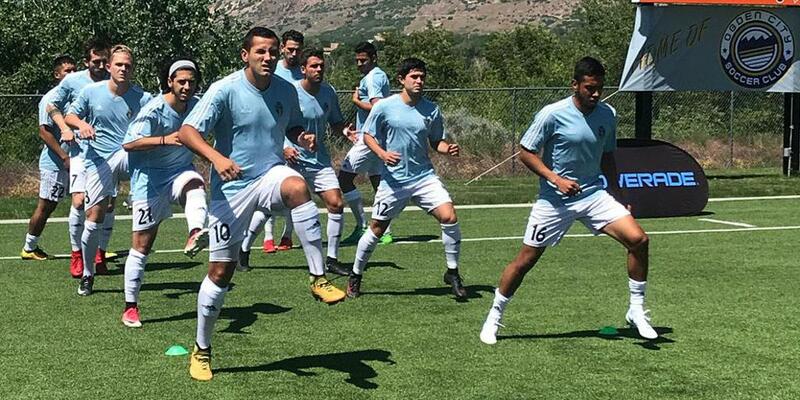 FC Tucson concluded its first back-to-back match road trip with a 2-1 win over Ogden City Soccer Club thanks to goals from A.J. Valenzuela and James Mcghee. The win improves FC Tucson's league record to 2-1-0 (six points). "We felt that at halftime if we improved in a couple of more areas, we could get back in the game," said FC Tucson head coach Dave Cosgrove. "And to (the team's) credit they made the adjustments and we were able to get two goals in the second half." The club found itself in another 1-0 hole after Ogden City's Skyler Milne scored in the 30th minute. FC Tucson nearly fell behind two goals eight minutes later, but an Ogden City chance smashed the posts and was cleared away. The score remained 1-0 heading into the half. Just three minutes into the second half, Valenzuela equalized after teammate Angle Ortiz split the defense with a through ball and left Valenzuela one-on-one with the goalkeeper. "All I knew is that I had to finish this or my coach is going to rip me apart," Valenzuela said. The goal gave new life to the team, who continued putting pressure on Ogden City. That pressure eventually paid off in the 71st minute. Dalton Pando sent a free kick toward the near post where his teammate James Mcghee dove toward the ball and flicked it back toward the far post for a goal. "I feel I made up for my mistake on the first goal because it was my man who scored the first goal," Mcghee said. "So I felt I had to get one back to even things out." The win follows a 1-0 loss to Odgen City on Friday evening.